Much like my last blog post, this one also seems somewhat obligatory at this time of year. Yeah, the old resolutions for 2012. For one thing, I need to get serious again about what I eat and how much exercise I can tolerate. I lost 25 pounds in 2011, but put some of it back on at the end ... especially during the holidays. So, sure, one of my resolutions will be to find my discipline again. But I wanted to come up with some writer-centric resolutions for this post. It wasn't so easy. As a guy who writes for a living, I feel I have my face smashed to the grindstone pretty good most of the time. I generally make deadlines and do my job. Still, there are some trouble spots that could use some work. Here we go. 1. Have more patience. I am NOT by nature a patient person. I feel like I am constantly tapping my foot and waiting for somebody else to get off the dime. I must force myself to realize I am but a single writer and not at the center of my editor/agent/producer's universe. 2. Don't have TOO much patience. Waiting to be sanctioned or waiting for permission isn't a good use of time. I'm going to use that time to GO. Work on SOMETHING rather than sit by the phone or constantly check email to see if my pitch/manuscript/idea was green lit or flushed down the toilet. Writing is a very make-it-happen-yourself business. 3. Finish things. I have eclectic interests. Eclectic is code for scatterbrained. I love science fiction, crime, fantasy. I write comic books, novels and screenplays. The result is I have a bunch of projects started and all in different formats and genres. Time to get organized and see these projects through to the end. I will sit down and prioritize which projects get attention first and for how long, etc. If I have a deadline, then I'm good about meeting it. But the projects I'm working on for myself always seem to sit there half-finished. No more. 4. Clean up/out my office. Declare "this is my writing space" and get to work. 5. Make contact with good artists, inkers, letterers, colorists, etc. Writing for Marvel means I've been privileged to work with some outstanding artists. But as I stumble and bumble my way toward some creator-owned projects, I need to do the legwork of meeting many of these types of professionals myself. 6. Drink more coffee. Is this even possible? We'll see. 7. Find that sweet spot between indulging myself and writing what a large audience might want to read. I always write better and faster when I'm working on something that interests me. I never think of audience. I tried to write a "big commercial thriller" once and it was a huge flop of a smelly turd. Got a hundred pages in and had to abort that puppy before I hurt myself and others. So I write for myself. But that doesn't mean I don't want other readers to like it too. So where is the balance? I hope to find out. 8. Write EVERY day. Sometimes, after I meet a big deadline, I think, "Okay, Dude, you deserve a few days off." As Clint Eastwood said in Unforgiven, "deserve's got nothing to do with it." Even if it's just a paragraph, I will do my damnedest to write every day. Okay, that's it for now. Not brilliant, earth-shattering stuff. Just some common sense things I hope will help. What about you? Any resolutions that could help a fellow scribe? So long 2011 ... What you lookin at, 2012? So why should I be any different? I mean, it's that time of year, right? Looking back .... looking ahead. What else is a blog for? In a way, 2011 felt like loading a bunch of bullets into a gun, bullets meant to be shot in 2012. 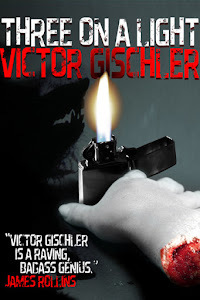 On the film front, a lot of progress was made toward the film versions of this novel and also this novel. I even wrote the screenplay adaptation of this novel myself. But it will be in 2012 that we see if any of these efforts go anywhere. Fingers crossed. Toes crossed. Eyes crossed. 2011 also saw new life for THE DEPUTY a novel I always felt maybe fell between the cracks a bit when it was making the jump from one publisher (Bleak House) to another (Tyrus), but thanks to a cool promotional giveaway by the publisher, the novel found a ton of new readers. In 2011, I took two trips to Italy. Hello, Italian readers! I love you. Coming to see you again in 2012. On the funny book front, I continued to write X-MEN for Marvel Comics. An honor and a privilege. 2012 will (I hope) bring some new funny book surprises. There is a strong possibility I'll be adding the words "creator owned" to my resume. Some years seem to drag by, endlessly pummeling us with misery. I've had those years. But now that I look up and rub my eyes and look at the wake I've left plowing through 2011, I sort of wonder where the year went. I got a lot done ... and yet ... and the same time I have an acute feeling of so many things left undone. Come January 2, I'll be hitting the gas pedal hard to make things happen. Hey, folks. People have been giving me books lately. Lots of them. For blurbs or just to check out or often for no reason I can understand at all. I'm not complaining, but it has been hard to get to them all, and I'm swamped as hell. 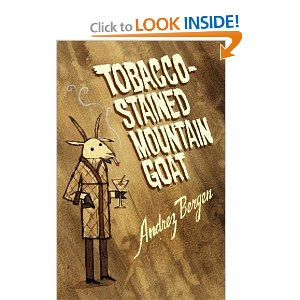 So when when Tobacco-Stained Mountain Goat by Andrez Bergen was brought to my attention I lamented the fact that I just don't have time to read it ... but I probably will when I can clear some time as it seems like my cup of java. I'm not familiar with Another Sky Press, but both the press and the novel seem well worth investigating. Apparently, the press gives the books away for free or at cost depending on the format, and you can send a contribution to the author if you dig the stuff. Anyone know anything about these guys? In the meantime, give this book a try and report back. If you've read it, let me know what you think. I never watched Battlestar Galactica on TV for the simple reason I knew I'd want to see it but I also knew I'd miss episodes and I hate having to catch up. So I ignored the entire run of Galactica ... until it came out on DVD. I then power-watched the whole thing in like a week. Frazzled my brain. Now ... a couple years later ... I'm watching it again. And enjoying it again. There are certain shows that I find very re-watchable, and I'm finding Battlestar Galactica to be one of those shows. (Although I've been warned that the last few episodes of the final season are not worth re-watching. We'll see.) I also have Band of Brothers on DVD and re-watch that from time to time as well as The Venture Brothers. I'm also partial to the Family Guy Star Wars parodies. I think I might also grab Archer on DVD. A good run of a re-watchable show is an important commodity. Something to put on in the background while working or to provide entertainment when I'm just flat out too lazy to delve into something new. So let's hear it. What shows do you find re-watchable? It's December. Don't wait until the last minute for your last-minute shopping! Okay. It's the season of giving, and I want your money. G0-Go Girls of the Apocalypse is the first of my novels ever to be turned into an audio-book, so for the loved one in your life too lazy to turn pages click here. But maybe that's a little expensive. 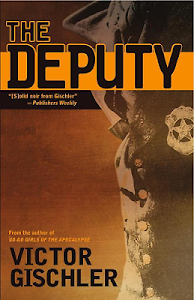 Hey, you can still get THE DEPUTY on kindle for FREE if you're an Amazon Prime member. Non-members only pay 6.99 and the "give as a gift" button makes it an easy choice for last minute gift-giving. Or you can really go low budget with my very early work THREE ON A LIGHT. Mmmmm, smell the cheapness. So why not inflict some Gischler on folks this season. They "deserve" it.